I recently attended the JavaZone 2012 conference in Oslo, Norway. This was my third time at the conference and just like previous years it was awesome. 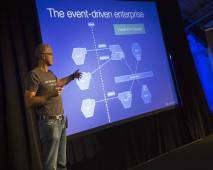 Decomposing applications for scalability and deployability from JavaZone on Vimeo. Phil Wills from the Guardian.co.uk gave a great talk Cracking the monolith: lessons learned from splitting the Guardian’s platform that describes the experience of splitting the Guardian’s monolithic application into separate services. You can view the video here. Karianne Berg gave a very entertaining albeit NSFW talk How about learning f***ing programming? about the need for developers to learn the holy trinity of programming – design, automated tests and refactoring – rather than just the latest shiny new framework. She began by equating the software developer community to the fashion industry. You can view the video here. Robert Smallshire gave a really interesting talk Averting Tragedy on the Architectural Commons about the problem of architectural decay and what to do about it. Robert made an interesting comparison between software development and farming. The talk also applied the economic theory of moral hazard to software development . You can find the video here. Bodil Stokke‘s talk on Painless Web App Development with Backbone was very educational. She spent the hour live coding a Backbone application in CoffeeScript using her Catnip IDE . The CoffeeScript code looked a bit ugly but its impressive how much you can get done with relatively a small amount of code. You can see the video here. The Thursday night after the conference I had dinner with @z_oleg at Cafe Asylet. I’d met Harold the owner a year ago on the flight home from JavaZone 2011. Good beer and very tasty Norwegian food. I had the Fiskesnadder – appetizer plate of mostly fishy things – and the Hjemmelagde kjøttkaker – meatballs. Highly recommended. This entry was posted in Uncategorized and tagged conference, javazone. Bookmark the permalink.